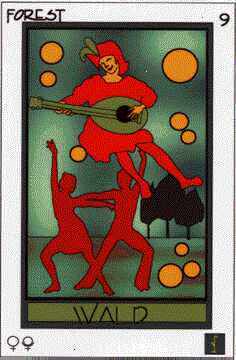 "Sing, dance and be merry" A joker plays his guitar suspended from gravity, entertaining a dancing couple, trees indicate natural flow, nine coins symbolize material gain, reached quite easily. Venus/Mercury: Joyful artistic exhibition, comedy. Theme for contemplation: Easy success Affirmation: "I am in tune with my deeds" Hint: Poets, painter, artists are good life examples of the way to combine work and pleasure. Everything flows easily towards its own fulfillment. 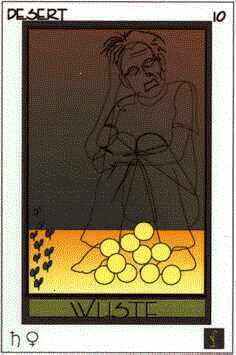 "Watch your desire, you get what you want" Ten coins are piled up in front of a frustrated, contracted human shape. No attention is paid to ten leaves that hint towards natural growth. A change of focus is indicated. Saturn/Venus: Inhibited love, unsatisfying gain. Theme for contemplation: Goalsetting Affirmation: "I know what I want" Hint: Sometimes the world appears more bearable with pink glasses on. This is not necessarily self-deception but a quite valuable change in perspective. A warning may be in place here regarding chemical help like XTC or LSD. Read ,The Nature of Personal Reality". 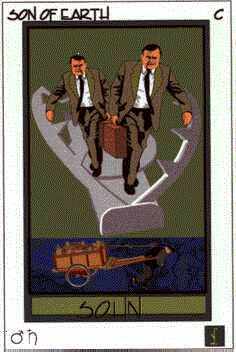 "Rat-race" Passing through a semi-closed trap are two businessmen, faces serious, aggressive pace. Below a Chinese coolie is suffering the weight and inertia of his loaded cart. Mars/Saturn: Running up against a wall, concentrated action. Theme for contemplation: Mechanics of the world of work. Affirmation: "Creation is my effortless natural ability" Hint: What is haunting you? What makes you so hard and unresillient? Is it worth the effort to ask about fears regarding your personal survival and the production or sales process you are involved in. Is the alternative to live in luxury, devoid of feelings -or- have an emotional rich but otherwise poor life? Comments or Problems: Thanks for visiting the lightage WWW server. We hope to meet you again soon. If you have comments concerning this WWW service please e-mail the webmaster of lightage.com.